When it comes to capturing and analyzing data, IT departments have more choices today than ever. And choice is a good thing. However, in order to pick the right tool for the job, you need to fully understand your requirements as well as your choices. This is certainly true in the world of Big Data. Hadoop and NoSQL databases have emerged as leading choices by bringing new capabilities to the field of data management and analysis. At the same time, the RDBMS, firmly entrenched in most enterprises, continues to advance in features and varieties to address new challenges. 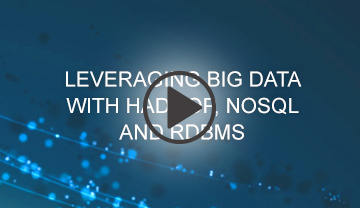 Click the image to the right to watch the webinar and learn more about how to leverage Big Data, NoSQL and RDBMS.